Do I need a special bootmgr for not wasting the ram? Because Iam still missing the ~200mb of the wim file when booting via wimboot. There should be no special bootmgr needed. Which version of Windows is this, and what test are you using which shows that 200MB of RAM is missing? Its a PE created by WAIK 2.0 and the test is a commercial software which shows sys info after booting pe. Are you able to reproduce the test result using freely-available software, so that I can observe the same problem that you are seeing? Just sent 3 versions to you. It is not only from checked builds that fail, but also previous or other versions. I think it is important to fix, because otherwise I suspect wimboot will fail with future versions of bootmgr. 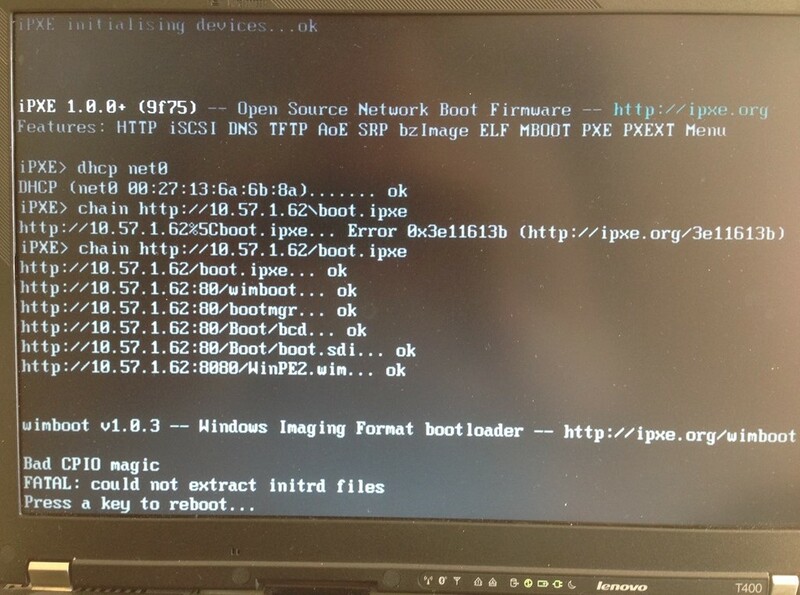 grub4dos loads IPXE.KRN but LOAD.IPX is never processed and the computer falls back to the network boot screen. The computer reacquires an IP address from DHCP and the grub4dos menu is presented again. Removing initrd /LOAD.IPX from menu.lst works fine and I can hit CTRL+B to to access the command-line mode. Removing pxe keep does not change the result. How do I need to configure the menu.lst file to run the script LOAD.IPX successfully? Thanks. I can reproduce the problem, and I'll get these working shortly. I get the error message message : Warning no such command chain. Replacing && with && didn't work too. I suspect that somehow you are "inventing" grub4dos syntax . Load as kernel the file /IPXE.KRN passing to it the parameter "dhcp" ,and if this succeeds, then execute the command "chain" with parameter "http://192.168.0.200...inpe/boot.ipxe"
What is the "original" that you are trying to "translate" togrub4dos? Edited by mcb30, 01 October 2012 - 03:41 PM. Then the issue is to *somehow* "escape" the "&&" which in grub4dos is an operator meaning "do if previous succeeded". Cannot say how this can be done. \n is a separator, \r\n ,means "new line", etc. Possibly Steve6375 is the one more familiar with this particular syntax. Some seconds later, I can see the boot message of iPXE. kernel /IPXE.KRN "dhcp && chain http://192.168.0.200/winpe/boot.ipxe"
Thanks for your help. I tried both of the options you proposed. kernel /IPXE.LKRN "dhcp && chain http://192.168.0.200/winpe/boot.ipxe"
iPXE obtains an IP address after the dhcp command but strangely it tries to download pxelinux.0 from the address below. Once again, iPXE ignores the script file boot.ipxe. Removing the second double quote had no any effect, the result was the same. Removing the second symbol " had no any effect, I received the same dhcp command not found message. Yep, what grub4dos passes is inside quotes, (or has a leading quote) evidently the IPXE.KRN does not support a parameter enclosed in quotes. the result is the same, right? I guess that the good guys developing ipxe should consider the idea of accepting a parameter enclosed in double quotes (i.e. strip them on the fly). The result is the same and I get the same Connection timed out message. Same result. This means that the double quotes doesn't have any effect. Try getting rid of the space before #!ipxe It should start at the beginning of the line. Hopefully this helps you to follow along with the topic of mcb30's original post in this thread. APPEND initrd=http://ip/images/winpe.iso --config-file="map (rd)+1 (hd32); map --hook; root (32); chainloader (hd32)"
Is this a bug in all later grub4dos versions or does the commandline changed? I switched from SYSLINUX 4.06 to SYSLINUX 5.01 to test wimboot successfully using your menu. FATAL: could not extract initrd files. Maybe you can give me a hint how I can solve the problem?